I'm about to embark on my second ever quilting project! 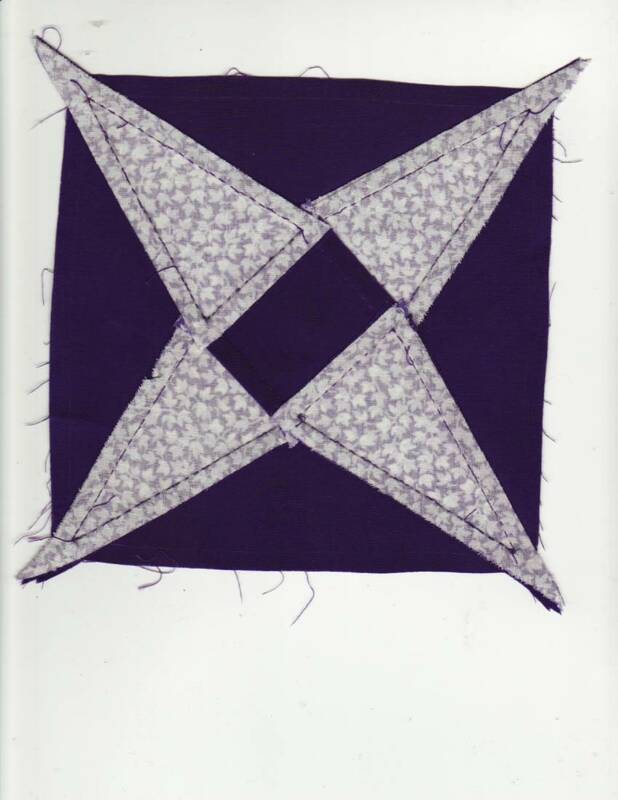 (first - you can see in my avatar - was a hand-sewn twin-sized that I pieced using cardboard templates - as shown to me by my mother in law). 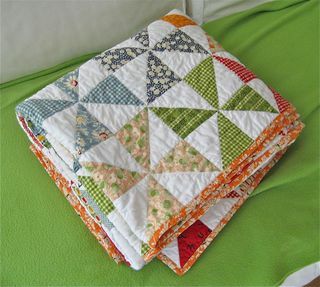 So I'm now looking for my next project to hand piece half square triangles. I have found this blog - http://whynotsew.blogspot.com/2012/0...g-block-1.html - which seems to be quite helpful but does anyone else have any other tips and hints? I'd like to do a simple pinwheeel design like the one show on the attached picture. My immediate thought (as a dressmaker and not a quilter) is whether or not a backstitch might be more effective than a running stitch? Is that just not the way it is done? They can be machine sewn also, but it opens up a whole world of difficult to hand piece shapes done easier. Jinny Beyer has always hand pieced and she has made the most intricate quilts that you can imagine. Her whole site is good, this is just one of the tips pages. Last edited by KalamaQuilts; 05-18-2013 at 08:25 AM. The websites that Kalamaquilts are great resources. When I hand piece, I do one back stitch whenever I pull the thread through. I find that hand piecing is more accurate for me, and more relaxing. 3) I do not stitch into the seam allowances. 5) When sewing a bias seam, I pull the thread 'snug', then I 'stretch' the four or five stitches a bit - I like to think that may minimize stitches popping when the item is used - because bias is stretchy. Jinny Beyer's book is very good! Last edited by bearisgray; 05-18-2013 at 08:41 AM. Thanks all! So helpful. Really good tips. Especially the one not to stitch into the seam allowances (which is one of the tips on Jinny Beyer's site, including backstitching at intersections). Otherwise I would have sewn them down not knowing how to deal with them. I LOVED sewing the first quilt a little each night on the sofa. So calming. So I'm very excited about this. This is what I was working on this winter. I learned that leaving the 'tails' on made it easier to press the units. Do you know how to make a quilter's knot? Notice that the stitching doesn't go into the seam lines. If you look carefully, you can see where I backstitched along the seams. Bear, your hand piecing is sooo straight! I had to look twice to make sure it wasn't machine sewn. 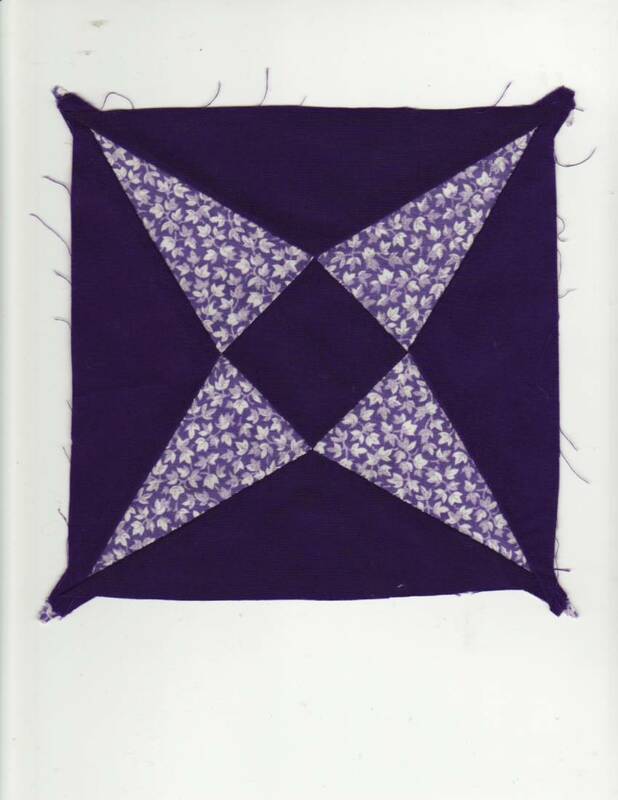 I hope I can get to be that good at my hand quilting. My stitches still go all wonky. i trace around the templates and follow the stitching lines - and pin a lot - there is no way that I could 'eyeball' that and get a straight hand-sewn seam! It's a slow process - but way more productive than sitting around playing solitaire!